Ever forget to be thankful? Sometimes the messes in life interrupt our gratitude. From her life experiences of depression and trauma, Susan M. Clabaugh relates how remembering gratitude can improve mood and remind us of the wonders of God’s blessings. Chocolate and Rainbows underscores how blessings can appear in many shapes and sizes. Walk through these 50 blessings and find your own chocolate and rainbows along the way. Life is full of trials. We all endure them. This journal is for anyone facing a difficult time. 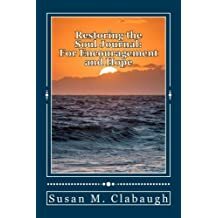 During my recovery from childhood sexual abuse and assault and my eating disorder, I have found journaling to be helpful, and at times, life changing. Airing frustrations, worries, hurts, and writing what God is teaching me. This book includes a piece of my journey, a few personal journal entries, and several blank lined pages with encouraging verses and quotes. It is my prayer God begins to restore your soul as you write your own story on these pages.